This beautiful square diptych dial in the shape of a book presents a wind rose on its cover and a lunar volvelle on its back. 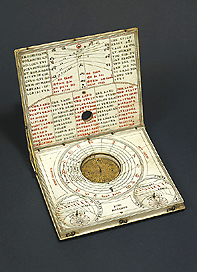 Inside the cover is a list of the places in which it is possible to use the sundial and their latitudes. Corresponding to the different latitudes are a series of holes in which a wire could be inserted, to be attached to the opposite end of the base. The shadow of the wire, projected on the dial below, allowed the time to be read on the corresponding circles. The signature of the instrument's maker, Hans Tucher or Ducher, is present on the dial, along with his maker's mark, a snake.